I’m about to say something that is going to make me extremely unpopular almost immediately, but I ask that you stick with me. After years of gazing down Hollywood Boulevard, both in the morning before guests are flocking to distant destinations and in the evenings when the neon sparkles brighter than the stars, I’ve realized that I don’t mind the Sorcerer’s Hat as much as I once did. It isn’t that I’ve mellowed with age or that I’ve become indifferent to the icon itself, but I have gained some perspective over the past several years that have allowed me to see the situation differently. The legal issues surrounding the Chinese Theater, the need for a more photographable wienie, and the work that has gone into the structure have all influenced the way I think about the Sorcerer’s Hat. The Chinese Theater which stood, and still stands, at the end of Hollywood Boulevard was a monument to the spirit of Hollywood. The original theater was opened in 1927, and was painstakingly recreated from original blueprints at Disney-MGM Studios, now Disney’s Hollywood Studios. Details that have been removed from the Hollywood theater were recrafted and adorn the park creation. However, due to complications stemming from new ownership and the Studios theater having the exact likeness of the original theater a solution had to be reached. Enter the Sorcerer’s Hat. In 2001, the new park icon was placed in front of the Chinese Theater as a part of the 100 Years of Magic Celebration, an event observing the one-hundredth anniversary of the birth of Walt Disney. So dedicated to keeping the theater and not remodeling the entire façade, that Photopass photographers were instructed to keep all signs of the theater from photos they took of guests. In fact, even the concept art for the Sorcerer’s Hat included very little detail from the theater behind and appeared only in darkened silhouette. While the Chinese Theater sat at the end of Hollywood Boulevard, much like the Tree of Life, Spaceship Earth, or Cinderella Castle sit at the heart of their opening lands or scenes, it was never the official mascot of the park. Icon status fell up the shoulders, or should I say ears, of the Studios’ water tower, dubbed the Earful Tower. Adorning passes and celebratory materials for years, , The Earful Tower could, and still can, be seen off in the distance from a few vantage points throughout the park and a bit closer to guests onboard the Backlot Tour, but it has never been readily accessible to guests. Whereas the Chinese Theater was readily available, but failed to have the towering wow effect the other park wienies supplied. The inclusion of the Sorcerer’s Hat granted the park an symbol that gave both a feeling of immenseness and could be easily reached. Over the years, the hat has undergone many structural and cosmetic changes. Today, the 122 foot tall assembly weighs in at 156 tons, sports LED lighting effects, and is the pin trading hub of Disney’s Hollywood Studios. It is a tremendous work of art and engineering, a symbolic structure dedicated to what Walt Disney brought to Hollywood, and it doesn’t belong at the end of Hollywood Boulevard. No, I’m not doing a one-eighty from my previous statement, it’s all a part of the same thought stream. The hat is a monument the creativity and hard work of the Imagineers to find a solution to a commanding problem and it is a piece of art representative of Walt’s gifts to entertainment. The hat is an imaginative icon that draws guests to it in easy fashion and makes them take notice. Yet, the Sorcerer’s Hat disrupts the feel of the entire front half of Disney’s Hollywood Studios, a golden age of Hollywood where the stage is set by the meticulous attention to the details of vintage architecture found along Hollywood and Sunset Boulevards. Set up along the Streets of America, presented near an exhibit showcasing the innumerable talents and skill sets of the Imagineers, the Sorcerer’s Hat would retain its ability to draw guests towards it even behind the guard shacks that mark the entrance to the Backlot areas of the Studios. There it could shine as a beacon to the efforts special effects have always had on Hollywood, it would retain it simply splendor, stand as a monument to Walt Disney, and return old Hollywood to the town it always was and never would be. I think the hat has merit but I just hate it's placement. I wish it was over the entrance to the park simply because it ruins Hollywood Boulevard. The castle, SSE and Tree of Life all work because they work with the theme of the land they were built on. In the Studios, a giant sorcerer's hat doesn't have anything to do with 1947 Hollywood. Matt, I agree whole-heartedly, it really does not have any place in the era of old Hollywood. 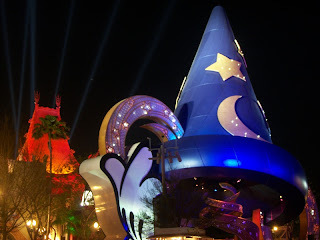 Over the entrance, or even in the plaza where the Christmas Tree has been for the past several years, would be great locations for the Sorcerer's Hat. I have been a long time critic of the sorcerer's hat, and still am. Ironically, Sorcerer Mickey is my favorite of Mickeys, however, The Great Movie Ride is my favorite of WDW's classic rides. The hat has made it impossible to get any admiring view of the theater from any angle whatsoever. I understand the reasons for its creation, I just wish there had been a better option. I'm a little late to the party, but I'd like to add my two cents and ask a question. My two cents: I like the hat, but hate the location it is in because it disrupts the theming. My question: What are these legal issues that Ryan is talking about that are making it so that they have to hide the theater with the hat?